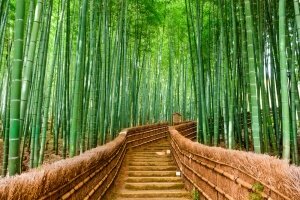 A former capital city of Japan, Kyoto played an essential part in the history of the country, being the official residence of the emperor for more than one thousand years, from 794 to 1868. Today, it is world-renowned for its many well-preserved shrines, temples, and other important historical landmarks that receive millions of tourists from around the world every year. Springtime, especially from mid-March to mid-April, is peak tourist season in Kyoto as it is when the cherry trees reach their full bloom. During this period, expect dense crowds in the city’s parks and gardens as people want to get the best seats to view the cherry blossoms. During summertime, from July to August, the city offers a number of festivals that are worth watching, such as the Gion Matsuri and the Gozan Fire Festival. In autumn, particularly in mid-October to mid-November, temples and shrine complexes, such as the Kiyomizu-dera and Tofukuji, get throngs of people who want to enjoy the beautiful colours of the autumn leaves. Wintertime (December – February) in Kyoto is dry and mildly cold, with an average temperature of 10 degrees Celsius. It is generally an off-season for tourism so it is the best time to go for travellers who want to avoid long queues and crowds. The past residence of the Imperial Family when the emperor and capital were located in Kyoto. It is located in Kyoto Imperial Park in the centre of the city and is a great recreational space. 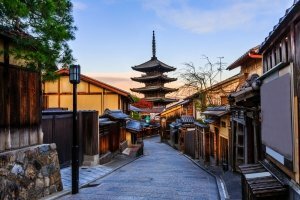 Other UNESCO World Heritage Sites that are must-visits if you are staying for a longer time in Kyoto are the Tenryu-ji, Ryoan-ji, Saiho-ji, To-ji, Ninna-ji, Nishi-Hongan-ji, Enryaku-ji, Shimogamo-jinja, Daigo-ji, Byodo-in, Kozan-ji, Kamigamo-jinja, and Ujigami-jinja. 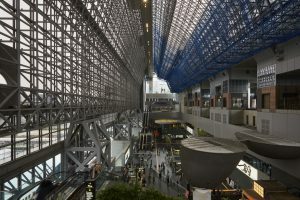 If you have time to spare before a train trip, or even make spare time because below Kyoto Station is the Porta Underground Shopping Mall and Cube Shopping Mall. Full of restaurants, Cafes, souvenir shops, fashion and accessories, underground Kyoto Station is definitely worth exploring. 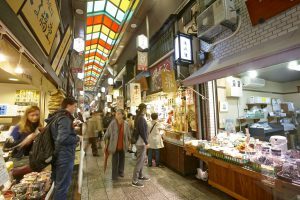 A long, narrow shopping street lined with restaurants and shops on both sides, Nishiki Market is dubbed “Kyoto’s Kitchen”. It is a dynamic and vibrant market that offers fresh fish and other seafood, fruits and vegetables, and local cuisines and delicacies. Renowned for its thousands of torii gates that form hiking trails leading to the summit of sacred Mt Inari, the Fushimi Inari-taisha Shrine is a Shinto shrine found in Kyoto. A round trip hike, which takes you through the woods and past a number of smaller shrines and observation decks, takes approximately two to three hours. Kawaramachi – Teramachi and Shin-Kyogoku Shopping Arcades, which branch off Shijo Street around the Kawaramachi intersection, are great spots for souvenir shopping. They are also packed with clothing shops and restaurants that are a little bit cheaper than the surrounding high class department stores. Pontocho – Lined with restaurants that serve a diverse range of traditional and modern Japanese dishes and foreign cuisine, Pontocho is a narrow alleyway and popular dining spot in Kyoto. Starting at 5 pm, visitors flock to this part of the city to enjoy sumptuous meals while enjoying the fantastic views of the nearby Kamogawa River and its surroundings. Kyoto’s transportation network consists of many railway lines, two subway lines, and a highly-reliable bus network. Because a lot of the train and subway stations are not located at convenient distances from each other for transfer, buses, as well as bicycles, are quite popularly used. Learn more about how to get around Kyoto here.